ABB announces AC500 PM595 PLC with a multi-processor system to handle the most demanding machinery and motion automation control and communication tasks. The AC500 PM595 Machinery Controller is optimized for robust, high performance industrial control, and is built around a 1.3 GHz processor with four 32-bit RISC processors plus an embedded double-precision floating point processor, 16 MB of user program memory and a large array of communications interfaces. The very high level of computational capability allows the new controller to handle extremely complex control tasks, involving complexities such as precision coordinated motion with very large quantities of axes, and mathematics-intensive computation such as real-time trigonometric calculations for robotics or other advanced kinematic applications. 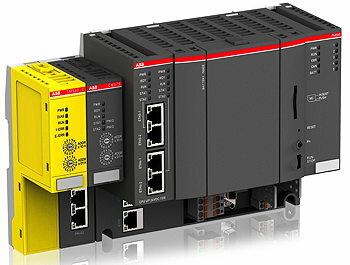 The controller also has a built-in interface to allow ABB's advanced safety PLC to be connected for high risk applications. Versatile connectivity is central to the new machinery controller's design. This allows it to be used with both legacy systems and today's favored networks - as well as providing a soft architecture that can handle future demands. Four independent Ethernet interfaces and an integrated network switch are built in. Two of these interfaces are programmable, supporting different Ethernet based protocols such as EtherCAT and PROFINET - allowing the PLC to be connected to control two different types of network simultaneously. TCP/IP, UDP, CAN/CANopen and two RS232/485 serial interfaces complete the on-board connectivity. Further networking and fieldbus interfaces may be added via the PLC's dual expansion ports. This variety of communication possibilities gives users the means to evolve control networks easily, to add new machinery or equipment into control system networks for example, even if located on another process line or location. To handle the increasing complexity of industrial control applications and the rapidly-escalating costs of developing software, the new PLC is compatible with ABB's Automation Builder programming capability. This engineering development environment provides an integrated tool-suite for control and motion systems based on PLCs, safety PLCs, motion control and related automation components - reducing software complexity, and cutting time to market and cost of ownership. All the tools required for configuring, programming, debugging and maintaining automation projects are provided via a common intuitive interface. "Machinery and motion control applications are becoming much more complex as machinery becomes more capable, smarter and safer, and as demands for more sophisticated human interfaces and communications grows," says ABB's product marketing manager, Wangelis Porikis. "The sheer computational capability of the AC500 PM595, with its rich feature set and versatile communications capability, provides enormous flexibility for automation builders. It provides a controller that can handle virtually any application, but also one that is highly software-configurable - giving OEMs a single control platform for a very broad range of applications."